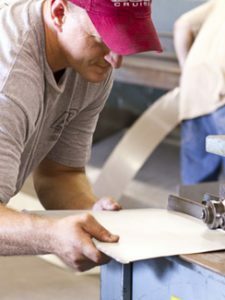 We believe our sheet metal fabrication department to be the best in the business. We have state of the art equipment and not only do we fabricate our own coping systems, gutters, fascia and counter flashings we also provide specialty fabrication such as mechanical equipment curbs, equipment stands, as well as custom sheet metal fabrications for any project requirement. Our fabrication shop is one of a select few in the Carolinas that has undergone the rigorous UL Testing and has achieved the prestigious NRCA ES-1 certificate. As a result of this testing we are listed on the NRCA Website as an approved factory location. The ES-1 Certification is a requirement on all major projects.